The International Association of Amateur Heralds • An heraldic void? In conversation with a friend; likewise interested in heraldry, he remarked that a certain country (which one at the moment escapes me), which did not have an heraldic authority was in an 'heraldic void'. municipal and provincial and national arms; and this is often (but not always) the concern of some government department, sometimes with the help of (legitimate) heraldic experts. So, the question is, is there really such a thing as an 'heraldic void', that is, anywhere where heraldry of any type is completely unregulated? Surely not. ... is there really such a thing as an 'heraldic void', that is, anywhere where heraldry of any type is completely unregulated? Without doing any research I would have thought it highly likely. Jonathan Webster wrote: In conversation with a friend; likewise interested in heraldry, he remarked that a certain country (which one at the moment escapes me), which did not have an heraldic authority was in an 'heraldic void'. Yes, there is - Australia for one, but in Australia we prefer to refer to it as 'an Heraldic vacuum' rather than a 'void'. This has been the legal status quo since the simultaneous passing of 'The Australia Acts 1986' in the UK and Australian parliaments. Since that enactment, there is no regulation of personal, ecclesiastical or corporate arms in Australia. However, that said, both the Commonwealth and the separate States have each enacted legislation concerning the regulation of state and national symbols which includes flags as well as heraldry. The majority of that legislation was enacted in the first half of the 20th century but as recently as 2004, to further clarify the use of State arms vs. the UK Arms of Dominion, the state of NSW enacted the 'State Arms, Symbols and Emblems Act 2004'. 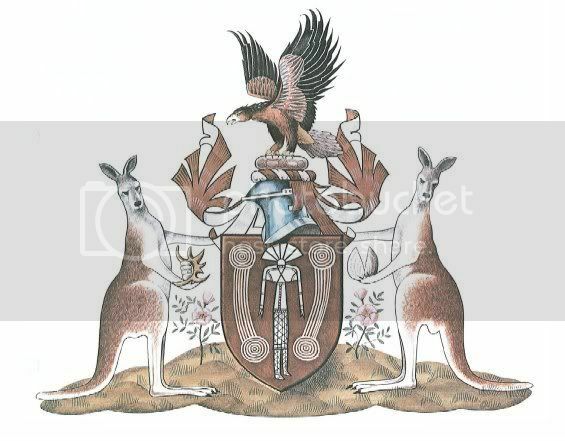 The latest provincial arms to come into existence are those of the Northern Territory which were granted by Queen Elizabeth, Queen of Australia, to the NT in 1978. The NT arms are unique in that, as far as I'm aware, they are the only provincial arms in Australia that bear a Tenné field. If a "heraldic void" is defined as a situation in which people and entities govern their own heraldry, then the U.S. is also a "heraldic void." Obviously there is no control of personal heraldry, but states, counties, municipalities, local water authorities, police departments, schools, colleges, universities, etc., etc. are all free to use or abuse heraldry as they wish. There is an Institute of Heraldry (TIOH) in the U.S. Army, but it regulates only the heraldry used by the U.S. Army, as the U.S. Air Force Historical Research Agency does for the USAF. TIOH provides design services for other U.S. government and military organizations--for a fee--and handles the manufacturing drawings and specifications for heraldic items for all the military services, but regulates only those used within the Army. But I do have a problem with the terminology itself. A heraldic void would be place where there is no heraldry. The situation in the United States (and in Australia and most of the known world) is better described as "heraldic liberty," the same situation that existed in England and Scotland before the Tudors and Stuarts started restricting personal freedom in heraldic as in other ways. I think this line of thinking stems from the idea of national heraldry. That is, the idea that the laws of heraldry are determined by a nation's government and only exist when they are actual laws. The opposite idea would be that there is a universal law of arms that applies everywhere. Conflicting practices in various jurisdictions make the idea of the same law everywhere difficult to reconcile with actual practice, especially, when such law would have to be rooted in tradition, which not all governments have approached the same way. JMcMillan wrote: If a "heraldic void" is defined as a situation in which people and entities govern their own heraldry, then the U.S. is also a "heraldic void." Obviously there is no control of personal heraldry, but states, counties, municipalities, local water authorities, police departments, schools, colleges, universities, etc., etc. are all free to use or abuse heraldry as they wish. There is an Institute of Heraldry (TIOH) in the U.S. Army, but it regulates only the heraldry used by the U.S. Army, as the U.S. Air Force Historical Research Agency does for the USAF. TIOH provides design services for other U.S. government and military organizations--for a fee--and handles the manufacturing drawings and specifications for heraldic items for all the military services, but regulates only those used within the Army. -I certainly wouldn't describe the USA as an 'heraldic void'. The national arms were devised by the government. The arms of all the states (where they have them) are often adopted by State legislation or some other legal means enshrined in law, which isn't quite the same as assumption. The Army and Air Force have bodies that regulate heraldry. Hardly the over-arching authority such as you get in, for example; Scotland, but far from an heraldic void at any rate. Geoff; I understand what you're getting at, but again; not quite. I've seen examples of quite legitimate arms that satisfy the definition of 'arms' or 'heraldry' in places as far flung as the muslim world (although I don't think I've seen arms of any kind, personal, municipal or otherwise emanating from Afghanistan; though I could be wrong. ), the far east; even in such places as (pre-communist) Vietnam. About the only place that I can think of to my knowledge that has no form of 'official' municipal, national or personal heraldry is China (with the exception of Hong Kong or Macau), though I could be wrong; and there is no native parallel equivalent of heraldry like the mon of Japan in China to my knowledge. Ryan Shuflin wrote: The opposite idea would be that there is a universal law of arms that applies everywhere. -this was the view taken by the heraldic author Robert Gayre of Gayre and Nigg; and I do agree to a degree. For a heart stopping moment I thought that you had described Gayre of Gayre and Nigg as an heraldic authority ... phew a double take reveals that you had written author! Gayre of Gayre and Nigg often provides some interesting heraldic reading but he was very much of the Innes of Learney School of writing ..... Its a sort of "This is how I say it is and how I say it is is how it should be ... and if you believe me, so much the better" style. They both did a lot for heraldry in general and Scottish heraldry in particular but most of what they wrote was how they had convinced themselves it used to be and therefore how it aught to be. Between them they invented a sort of heraldic utopia. Well I certainly don't agree with everything he had to say about the subject but some of his opinions as regards the law of arms made a lot of sense, for example, his criticism of English heraldic practice, which in his eyes was unfairly harsh those who were illegitimate (in that an illegitimate child isn't always granted the same arms as its father, whereas in Scotland they have a right to matriculate the arms of their father with suitable marks of difference; and that both the English heraldic position and the English legal position at the time was simply a product of later attitudes and certainly was not the attitude taken in the mediaeval heyday of heraldry. I do think both Gayre and Innes were a bit over-eager in their criticisms of the College of Arms and English herald practice, generally speaking. Anyway, it can't be denied that there are certain things that are universal to all traditions of heraldry-but there aren't many of them. I think what Gayre was getting at was that the Law of Arms had to be international from its outset because Armigers from all over Europe would be coming into contact with each other on the battlefield and particularly on the Crusades so it would make sense for there to be conventions and rules applicable to all arms. Jonathan Webster wrote: //snip// the Law of Arms had to be international from its outset because Armigers from all over Europe would be coming into contact with each other on the battlefield and particularly on the Crusades so it would make sense for there to be conventions and rules applicable to all arms. In the beginning .... Conventions ... probably (as a gradual development of international diplomacy of which heralds were an integral part of the machinery), Rules .... possibly (but only as a result of collaboration between heralds as a result of their desire to control any developing conventions), but I would question the assumption that there had to be some form of international law of arms from the outset; the concept of international law is very recent. Heraldry, in the beginning, was mercifully free of any laws and, as we are all aware, in most parts of the world, remains so to this day.